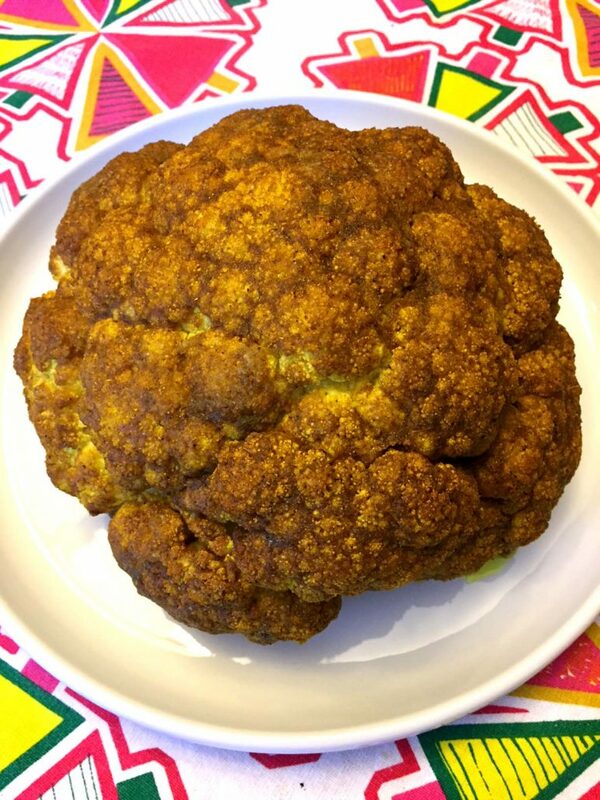 A whole head of cauliflower makes an impressive-looking roast! This spicy curried whole roasted cauliflower is bursting with flavor in each bite! Who says cauliflower should be bland? 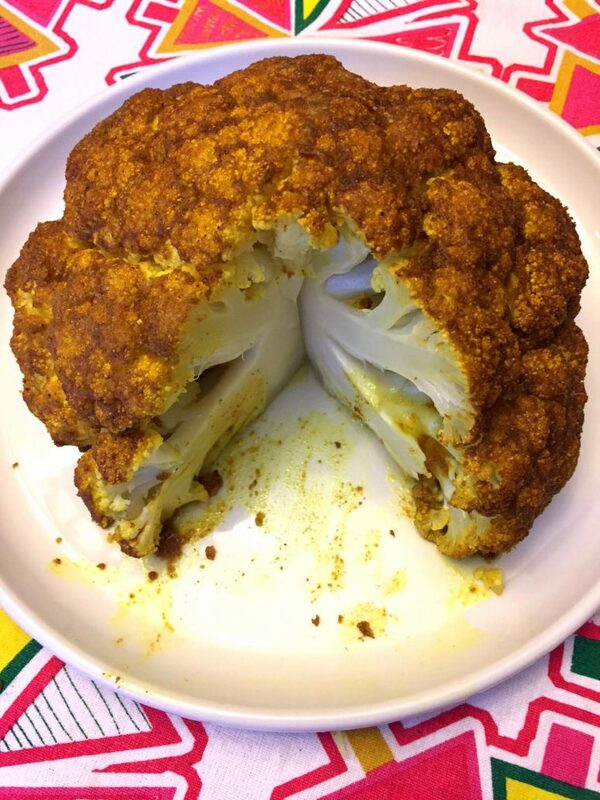 This curried roasted cauliflower is just the opposite! The curried flavor is so deep and intense, you’ll be totally satisfied with your fix of spicy! 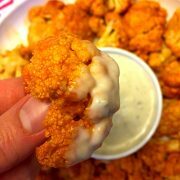 Once you taste the first curried cauliflower bite, you’ll be reaching for another and another and another. This spicy curry stuff is seriously addictive! 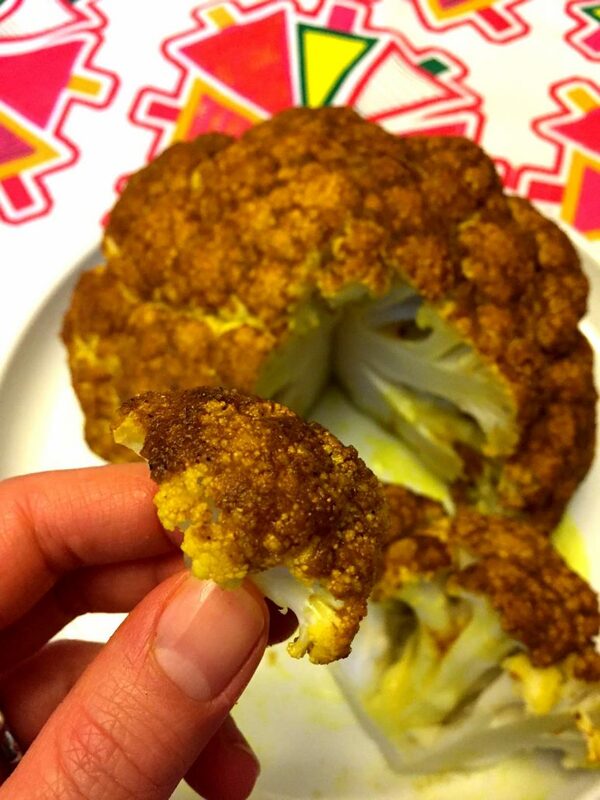 If you’ve never tried roasting cauliflower whole, you are in for a treat! Just stick the whole head of cauliflower in the oven and it will roast perfectly! When I make regular roasted cauliflower, I break it up into florets. 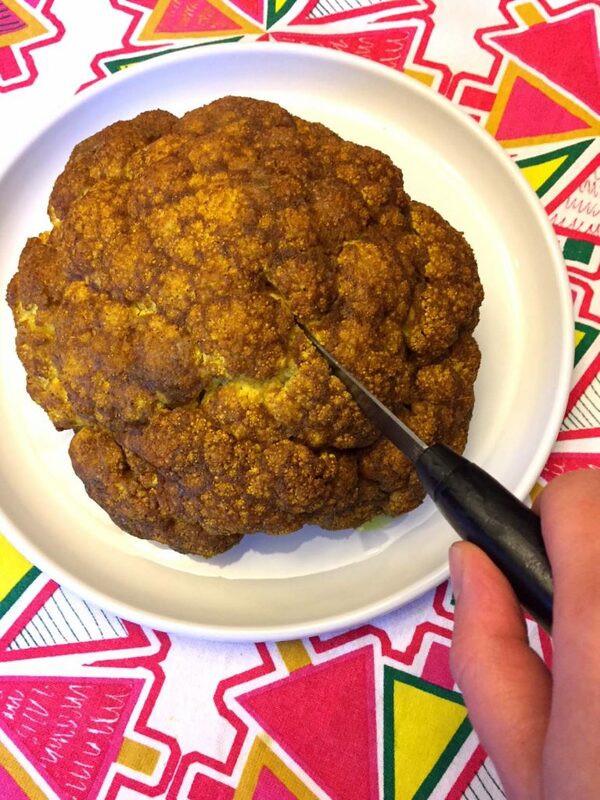 I’ve been doing it that way for years and didn’t even think of roasting cauliflower whole until recently 🙂 Baking cauliflower whole saves you a lot of work, since you don’t have to separate and cut the florets – that’s a great news for lazy cooks! Whole roasted cauliflower looks so impressive! It’s like a big meat roast, but vegan 🙂 Whole roasted cauliflower would make an amazing centerpiece dish at a vegan holiday table! 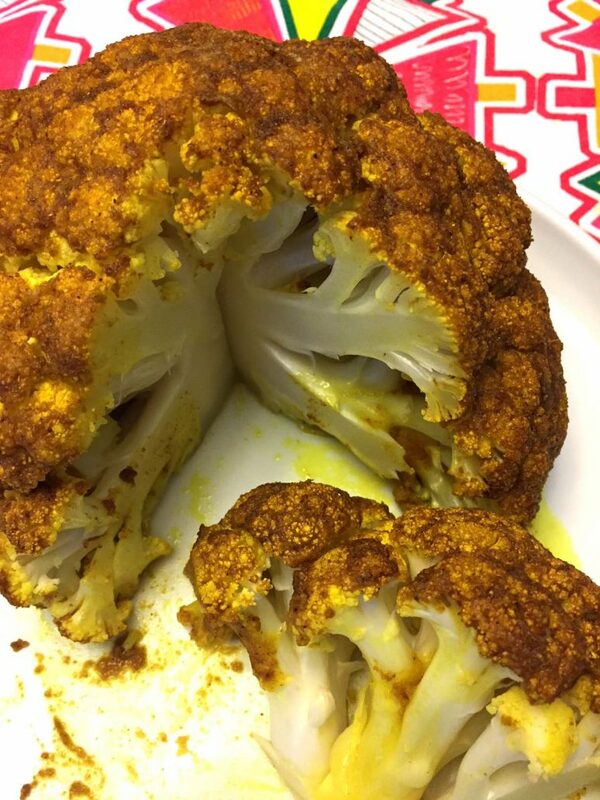 Before the whole cauliflower is put in the oven to bake, it is rubbed with olive oil mixed with a curry spice mix. 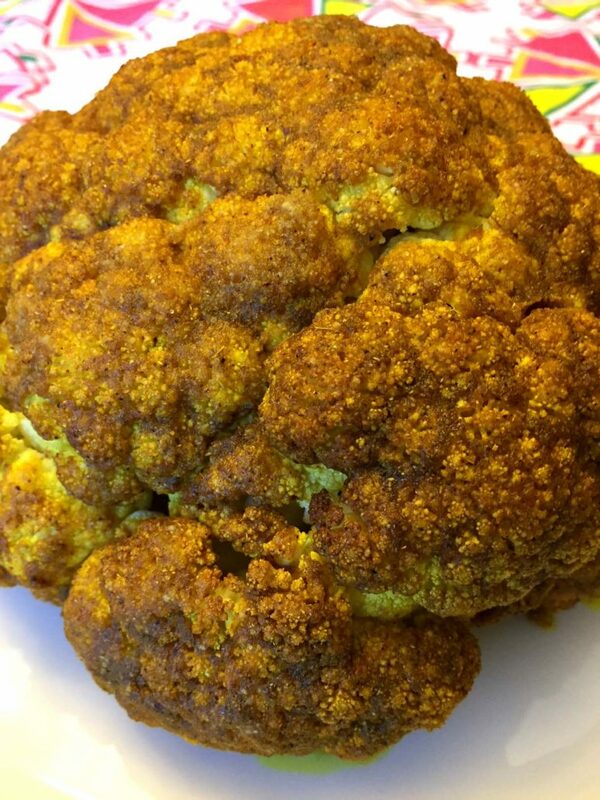 This homemade mixture colors the cauliflower such beautiful golden brown color! 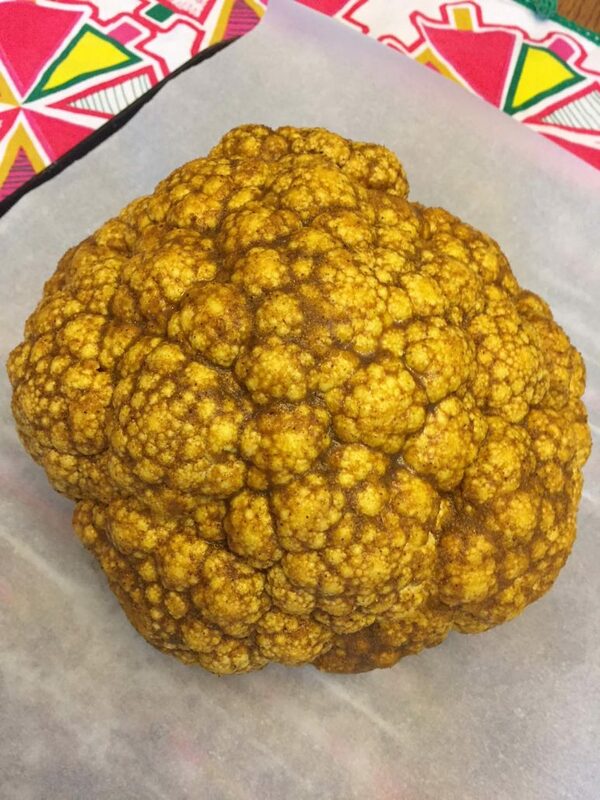 I also love how this curried whole cauliflower looks when it’s carved. It’s golden-brown on the outside and white on the inside, so the slices are so beautiful! Next, rub the spicy mix all over the whole head of cauliflower. Put the whole cauliflower in the oven and bake at 375F for 40 minutes. Remove from oven, carve and serve! 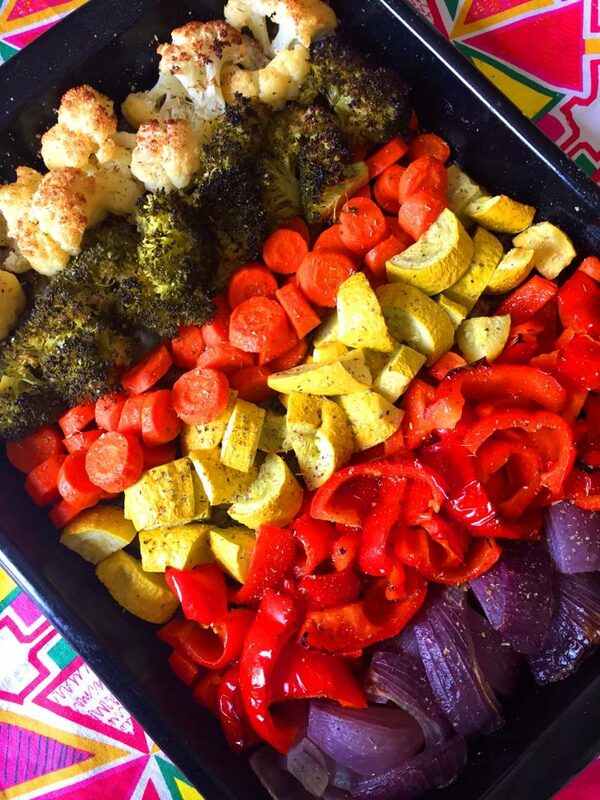 Rainbow Roasted Vegetables – different color veggies arranged on the baking sheet in a rainbow manner and roasted to perfection! Perfect party dish! Roasted Parmesan Cauliflower – Parmesan cheese and cauliflower go so well together, mouthwatering! Spicy Garlic Roasted Eggplant – these roasted eggplant slices are so spicy and addictive! It’s my favorite way of eating eggplant! Cranberry Roasted Brussels Sprouts – so colorful, vibrant and delicious! 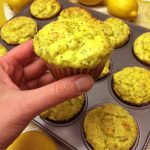 Tastiest way of eating brussels sprouts! 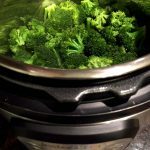 Parmesan Garlic Broccoli – broccoli is roasted in the oven in Parmesan, garlic and olive oil mixture, and sprinkled with roasted almonds! 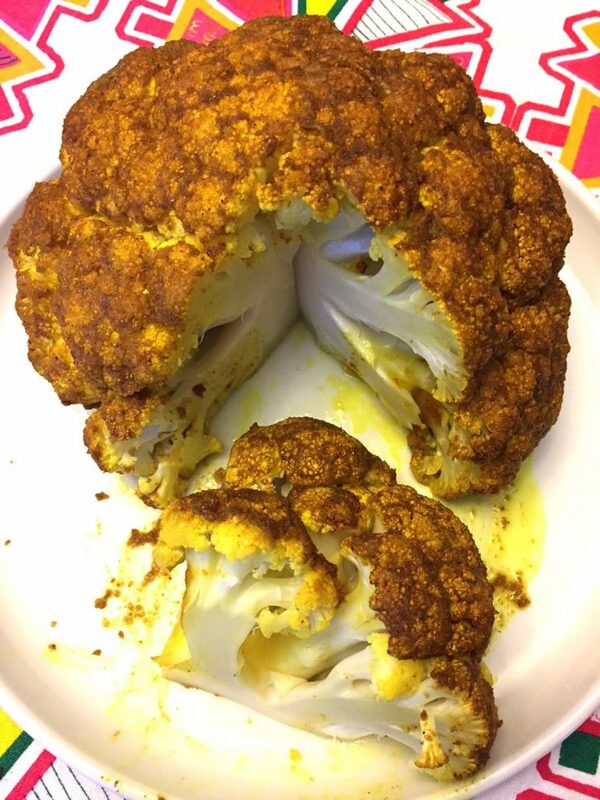 This curried whole roasted cauliflower looks gorgeous and tastes amazing! 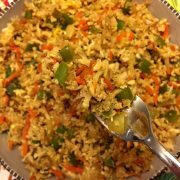 So easy to make and so full of flavor, you can eat the whole cauliflower yourself in one sitting! Remove the leaves from the bottom of the cauliflower and trim the base. 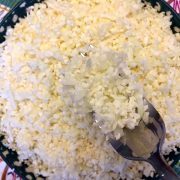 Wash the cauliflower, then dry it with a paper towel. Put olive oil, curry powder, garlic powder, red pepper and salt in a cup and mix until combined. 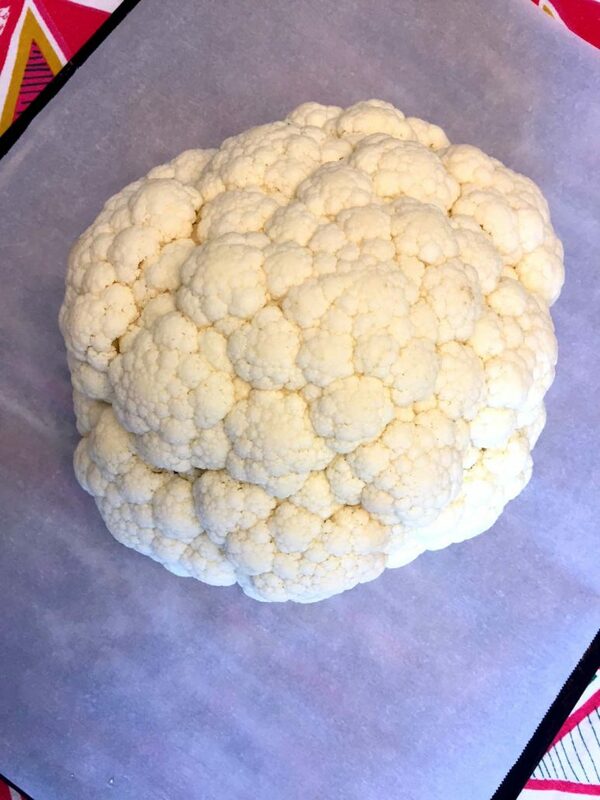 Put the whole cauliflower on a baking sheet. Brush the curry mixture all over the cauliflower using the pastry brush. Put the cauliflower in the oven and bake for 40 minutes. You can use chili powder instead of curry powder!